This is the first post from me here at Bauer-Power in what seems like ages. I'm sorry about that. Please note that I most certainly have not abandoned the blog here. I've just been really busy with my new political blog Mainwashed. If you have a few moments, go ahead and check it out. Anyway, so I have this user at work who has been coming over to the IT area for the last few weeks with an issue that I'll admit, I hadn't seen before. 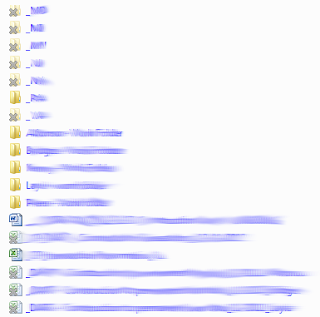 We have disabled offline file caching on all workstations as well as on our Windows 2008 file server. 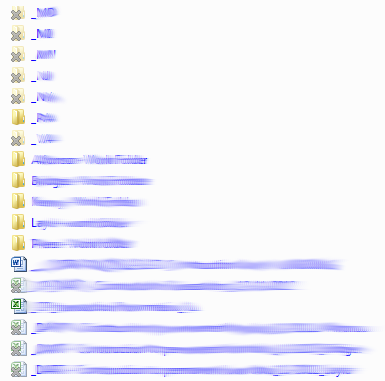 Still though, she was still having a strange caching problem that would cause files and folders in one of her file shares to appear with a gray X on them, and she wouldn't be able to open them. Also, if she saved a file, the update wouldn't actually make it over to the server. It would just store in the cache area on her computer. Strange right? That's it! Ever since we did that, this particular user has been right as rain! How to Enable/Disable Network Sharing feature in Windows 8? I know that periodically I stop posting about technology stuff and go off on rants about the Government. I'm sure that most of you don't come here for your dose of political rhetoric, so I've decided to take my views to a new blog that I've started called Mainwashed. Mainwashed is a cross between mainstream media and brainwashed. Clever right? Excuse my while I pat myself on the back and congratulate myself on how awesome I am. Anyway, I decided to start Mainwashed much for the same reason as Bauer-Power: Before I started Bauer-Power I was telling my colleages, and people on MySpace (Yes, we've been around that long) about cool software that I found and nobody gave a crap. I decided to start Bauer-Power to put what I enjoed talking about "out there" and the people who gave a crap would find it. The same goes for Mainwashed. I like rasing awareness about the crap our Government does to us, and when I try doing it on Facebook, nobody cares. As long as Honey Boo Boo, or a sports game is on, they can care less how bad our Government bends us over and has their way. I decided to put out my dissenting political views on my new blog, and those that want to wake up will find it. If you have some time, you should check it out! The Battle of Athens (sometimes called the McMinn County War) was a rebellion led by citizens in Athens and Etowah, Tennessee, United States, against the local government in August 1946. The citizens, including some World War II veterans, accused the local officials of political corruption and voter intimidation. The event is sometimes cited by firearms ownership advocates as an example of the value of the Second Amendment in combating tyranny. Did you like it? If so, please share this page with everyone you know that supports the 2nd Amendment, and never want to see it taken away! Anyway, someone sent me this infographic that shows you the inner workings of an Oscilloscope and I thought I would share it with you. Check it out! Super Easy Tool To Contact Your Representatives in Washington D.C. I often times get political. Those who follow me on Twitter or Facebook are sick of it I'm sure. I mean, when something that the Government does that I feel they shouldn't, it really chaps my hide. I mean, good men and women died to give us this remarkable, and unique form of Government that protects the people, and gives us our liberty. Any type of restriction on that gets me pretty pissed off. I don't care if it is a restriction on my 1st Amendment rights (SOPA), my 4th Amendment Rights (CISPA), my 5th Amendment Rights (NDAA) or most recently, my 2nd Amendment rights (Take your pick). Anyway, there is only so much one can do as an individual. One of those is complaining on Facebook and Twitter, but that is only good if you use that to mobilize others to do the next thing. That is to contact your representatives and tell them how you want them to represent you. After all, we live in a Constitutional Republic, not a Democracy. That means that instead of everyone getting a voice, we elect representatives to give us a voice. It's up to you to tell them how you want to be represented. Constituent communications are flooding and overwhelming Congressional offices. 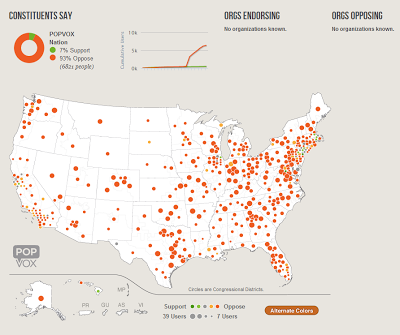 POPVOX verifies, aggregates, and simplifies communication with Congress on an open and trusted (and nonpartisan) common ground. Advocacy organizations, trade associations, unions and other groups send their members to POPVOX to take action on bills pending before Congress. 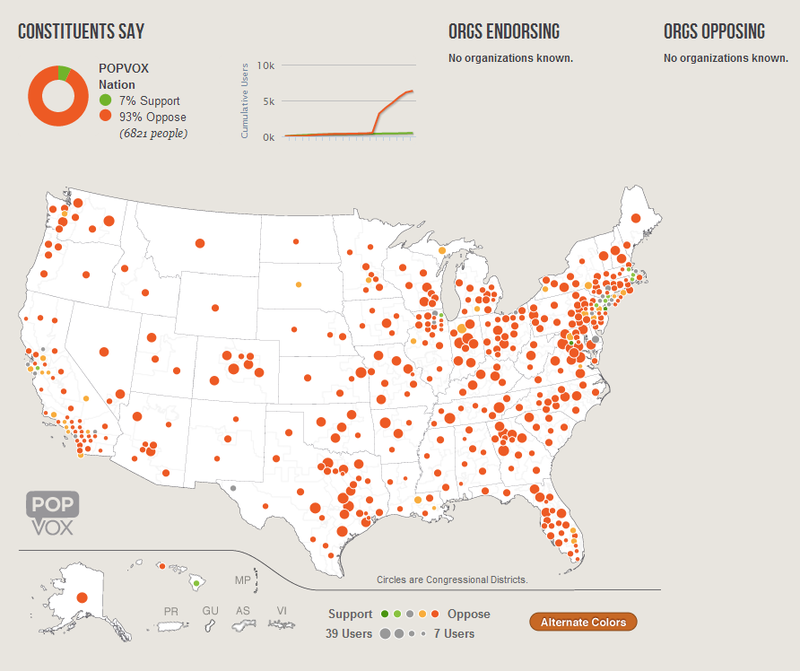 Congressional staff and lawmakers log into POPVOX to measure the pulse of their district. POPVOX provides a curating interface for anyone — including Congressional staff, the public and the media — to access and understand the voice of the people. As you can see 93% of Americans oppose this bill. Perhaps because more people enjoy their 2nd Amendment rights than the media would have you believe. Or maybe because the 2nd Amendment is the only Amendment using the words, "...shall not be infringed" and the rest of Americans understands that. I don't know. Anyway, no matter what your view is on whatever the issue, PopVox is the perfect tool for you to sound off! Firearms Policy Coalition pledges "not one more inch." Are The Feds Preparing For Civil War? Happy New Year everyone! I hope you all had a very safe New Years Eve! I've been taking a break from the blog for the last few weeks because of holidays and such, but some stuff has happened recently that made me want to take a moment and use the blog as a political soap box (again). That being said, and with the outrageous "fiscal cliff bill" being passed, many Americans are fed up with the Feds. I think the Feds know it too, that's why the DHS has been busily buying up over 1 billion rounds of ammunition. So what do you think? Is America heading for another civil war? Let us know your take on all of this in the comments.